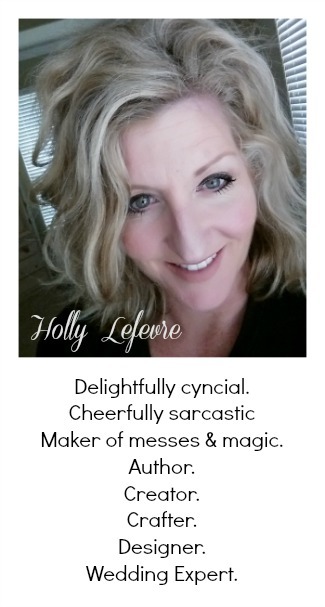 So, I thought I was unscathed yesterday by Blogger...my post was up, I had comments...guess what it disappeared last night...so I am posting my writers workshop submission again. Bummer too...you all had great comments about these cars! I come from a car obsessed family. My parents, mainly my dad, have a habit of buying cars "just because." They are always buying or talking about buying a "new" car. At one point, with four drivers in the house, we had 7 cars. When it comes to cars, my Dad has a plan and a purpose. Did you know some cars cannot be driven on rainy days?...Or even when it is foggy outside? And some cars cannot be driven outside the city limits? Go figure! Anyway, here is the tale of my first car...or cars as the case may be. Around 14 my Mom and Dad began preparing for the glorious day I turned 16 and I could haul my friends around and also haul my brother to ice hockey practice at 5 am. My Dad began talking about the Volkswagen we could "build" and how we could "trick it out." Then he bought a VW Baja Bug...he was going to teach me how to drive it and keep it for me...for two years. It was red...I was happy. I was fourteen I had a car waiting for me...I was happy. Two months later he got an offer he couldn't refuse...he sold it. Now, repeat that same story about 5 more times...the cars were not always red, in fact one was the color of vomit...but it was "the factory paint job," meaning it would remain the color of vomit. The cars were not always going to be "tricked out." Some were going to remain as is. They were all stick shifts. I learned how to drive on a stick and I love a stick shift and when hubby and I bought our first car together (a Mercedes) I asked if it was available with a stick shift, and no they did not throw me out. In between all of this, as all appreciative children do, I begged for a different car. The cute girls drove Karman Ghias in aqua, orange , or white. at least a convertible bug painted aqua, pretty please. I could tell that I could not convince my Dad to paint it. I finally accepted it - oh the horror! "Hey, can you drive my car over so we can go for a ride?" the kind I would D-I-E for. It got closer and closer and I saw my parents in it. 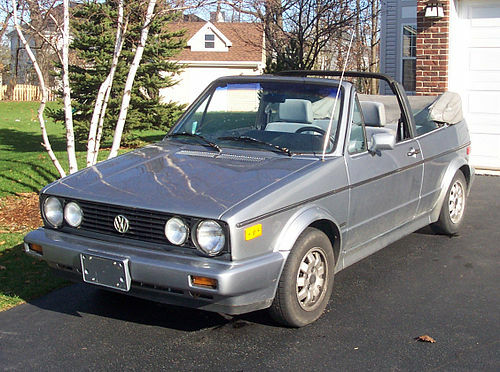 Um, yeah they went and bought me a Volkswagen Cabriolet. Now I was almost 16 and had a new convertible beach mobile. With the personalized license plate of FEVRISH. I was so cool (or so I thought). On my 16th birthday, I had an appointment for 9 am at the DMV. I picked up 4 friends and was gone until 9 pm that night. my VW saga came to an abrupt end. until I got my stick shift-less Mercedes. My hubby refuses to buy me anymore VW's! So, what was your first car???? p.s. none of these are my actual cars. My first car was a Hyundai Accent. I bought it when I started working. I love VW's. I had 2 Jettas but I always wanted the bug and the Karmann Ghia. A car waiting for you? And a convertible at that! You don't know how lucky you were Holly, no matter what the color. I remember that other post too. I think I told you then that I inherited a green 1965 Pontiac GTO. She had a 389 CF engine, and that baby would get up and go. If only I had kept it, she would be a beauty to have now. A navy blue Toyota Corolla. I was at a friend's house and my Dad came to pick me up in it and when I came out he told me to get in the driver's seat (Yes, I was the baby. Yes, a bit spoiled. But also it was HIS last chance to give one of his kids a car, and he had learned the lesson of constant maintenance on the clunkers her got the other sibs). Love your puke colored bug story! my 1st car was so totally NOT cool or cute...it was a 1978 brown caprice classic (huge ugly tank to drive around!) but I moved on....our family has WONDERFUL memories of vw's (slug bug no backs!) & vw buses too. My mom's 1st car was a karman ghia! thanks for sharing - brought back great memories of family stories! A 1987 Buick Regal...LOL. It was 2001. When I was little, I thought VW bugs were so cool! Whenever I saw one, I would say "Pretty little car blue!" [insert color of car] My parents still talk about it. Anyway, I learned to drive in a nasty minivan that was so embarrassing! My parents would not let me have a car even if I paid for it. My senior year of high school they finally gave in and let me lease for a year if I agreed to drive my little sister anywhere she wanted to go. It was a red Hyundai Elantra. I decorated that thing with everything cute I could find...leopard print fuzzy dice, stuffed animals, signs, etc. It was so cute! 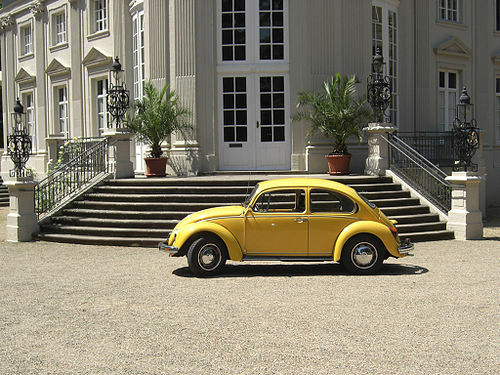 My first car was a baby blue VW bug. I loved that car but the heater didn't work so I had to drive with a blanket on my lap in the winter. Great story! It takes me back. 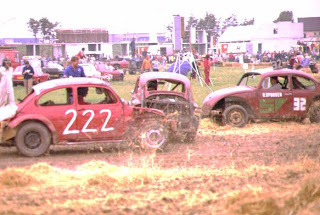 The Baja bug mention made me smile - years ago, my ex built a Baja "beach buggy", we called it. Never drove it on the beach, but it was a pretty cool vehicle. Thanks for sharing - and the smiles! This post was a great read, Holly! My first car was a funky green- that's really all I remember about it! My dad only drove Fords, so that's probably what make it was. I remember being disappointed when my boyfriend's car was a stick shift because it meant I couldn't hold his hand as he drove... remember when that was important! Great post! When I turned 16 I got a Ford EXP, no back seat, sun roof, sporty car, that was a stick-5 speed and I drove it through high school and college and then for another year. My parents got it for me because my grandfather won a brand new truck and gave it to my brother when he was 15. But I loved my car. Thats so cute how your parents surprised you! One of the cars I learned to drive was my sister's jetta.. and a minivan. I also wrote about my first car! WOW! Loved how your parents surprised you! My first car was a convertible mustang when I was 18, I did look at the VW Cabriolet lol....then when I finished university I traded it in for a BMW 318 because I was working in the financial district and I sort of out grew the mustang. Great car memories post Holly, as you know I love cars & sometimes even show me driving in my post, that how much I love my car & driving! My pleadings for a Karman Ghia never paid off either. I wonder what our girls will be begging for when they hit that age? Very lame huh!? My post stayed but all my comments have dissapeared! And I do believe some from the previous post too. Very weird. My first car was a '62 Corvair (you know the cars they quit making because of safety issues! )...not to be confused with a Corvette! My brother rebuilt the engine in shop (at school) and my dad put in new shag carpet and repainted the outside a nice nice "Datsun 240Z baby blue color" as per my request. My parents even gave me my own gas card to be used "only in emergencies" (you know, engine failure and such!) But, an emergency to me was no gas in the tank! Well, my little emergencies soon racked up a $60+ bill on the credit card...and considering that gas was only about 60¢ a gallon (oh the days! ), that was quite a bit of gas. So, my card was put on hiatus for a while. I drove that car all through high school until someone side swiped me and totaled it. Of course, with a '62 Corvair back in the 70's it didn't take much to total it! I think my parents got a check for about $600 from the insurance company. ha! I also wanted a Karman Ghia - in orange. I thought I was the only one that coveted this in my early years :) And for the record, I didn't get one. My dad said b/c I was so short, I wouldn't be able to see over the steering wheel and reach the pedals, b/c they sit really low. (I'm 5'2") I'm sure this was just an excuse, since I assured him I would figure out a way! My first car was some type of Mazda hatchback w/ a bowed in plexi-glass back window! It was NOT attractive! But I'm not complaining, it was a car! My dad ran his own business, beginning as a mechanic and expanding quite greatly. I think I started out in a modified stock car at the age of 4 (LOUD!!!). My dad was a master car builder and owner of stock cars as a hobby and is a legend in our state, and featured in a Hall of Fame as well. My parents let me drive some huge, old Oldsmobile (went through lots of them) through our "back 80" (really) while sitting on a pillow. I thought it was the greatest thing ever...gosh, I was only like 7. It was when there were no crops in the corn fields that my parents rented our for farming. THEN came the beloved golf cart that Dad took the governor off of. I once took a corner too tightly, flipped it, the gas pedal stuck, flew right past me, but my friend & I jumped on and it just kept going. Oh, so many, many, many cars. He'd say, "It's yours 'til I sell it." Through college I had the ugliest-colored Chevy or something like that. We called it the "snappy dog" cuz it looked like the color of those gross food service hog dogs...over cooked to where the skins snap. When I graduated college, I got a knock-out Grand Am with the most excellent sound system (at the time anyway), and all the bells and whistles. THAT was mine to keep. Just driving a van now (but I do love the sliding doors with kids). I'm holding out for a BMW SUV, and a BMW blue convertible when I no longer have kids riding with me. nice cars! i am a great lover of cars! nice title of your blog A Girl and her Cars!